A suspended or dropped ceiling acts as a second layer to your ceiling, used most often to hide pipes and wires above. Usually the suspended ceiling will hang from the original with a metal grid and tiles are slotted in. Suspended ceilings can be used in both domestic and commercial applications and act as a cheap way to improve the look of certain rooms in the property. Adding a suspended ceiling to your home can instantly reduce noise from above, which is especially handy if you have noisy neighbours. You’ll be able to find tiles which provide extra soundproofing qualities and sound attenuation batts can be fitted to cut noise further. 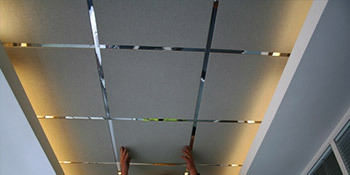 Suspended ceilings are popular in hospitals because humidity resistant tiles can be used. This makes them great for kitchens and bathrooms too. You can also use anti-microbial tiles to stop infections and prevent the growth of bacteria and mould. Even though using a suspended ceiling will effectively cut your room’s space, with mirrored or reflective tiles you can give off the impression of having a larger room. They maximise lighting in the building by reflecting it around the room and this in turn can cut your electricity bills too. Heat is lost through the walls, ceiling and windows, so adding an extra layer of protection will help to reduce heat loss and reduce your energy bills. As an added bonus this also means that carbon emissions will be reduced too. With a suspended ceiling you can benefit from a range of bonuses and they’re not simply just for hiding pipes and wiring. You can reduce your bills with improved insulation, cut noise pollution and more. For up to four FREE quotes for a suspended ceiling in your property, complete our quick form and hear from vetted and reputable professionals in your area. Project: Suspended ceiling required for a church building in Hockley - Birmingham Area. Project: 25 white vinyl ceiling tiles. They are for domestic use only and I can collect them if you are Croydon-based. Thanks. Project: I am looking for a quote for a suspended ceiling in one of our sheds at the above address: 24.5m long x 9m wide x 2.8m off floor Can you also inc price for insulation and light fittings.